Today, implementing hardware-based security is a widely recognized best practice compared to software-only based approaches. However, the complexities of enabling systems with discrete hardware security components from multiple vendors creates design, deployment, and operational barriers that hinder adoption of such high-assurance protections. With multiple discrete hardware security components, ...each with diﬀerent and disconnected root of trust capabilities it may not be possible to fully integrate these security capabilities into a cohesive security architecture. The result is often a fragmented solution with significant barriers for upgrades post-deployment. In contrast, Intel’s general purpose systems-on-a-chip (SoCs) with integrated security oﬀer a new way forward to implement hardware-based security. 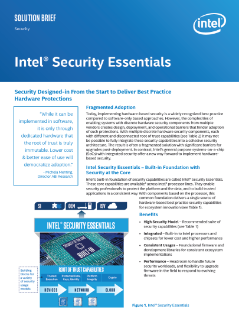 Intel’s built-in foundation of security capabilities are called Intel® Security Essentials. These core capabilities are available across Intel® processor lines. They enable security professionals to protect the platform and the data, and to build trusted applications in a consistent way.